- Thomas Blackburn, "An Easter Hymn"
This is one of my favorite trees! I jush the blooms stayed on a little longer. We these are so beautiful! Beautiful flowers at a great angel. That is a lovely shot. Love the close up with all the detail. Just beautiful. I wish these beautiful trees would grow in this desert I live it. Thanks for sharing. We have one in our backyard. I love it! Very pretty! Don't you just love spring? I love this photo! There is so much depth with the foreground flower. Very beautiful! Also, thanks for your comments and linking up with me this week again. It's like they're floating on air...so beautiful! Ah those are absolutely stupendously gorgeous! Unique angle for the photo! Love the grey sky behind it too. Beautiful shot! I love the DoF. The tree looks like it goes on forever. Beautiful and I love the perspective. beautiful, love the angle you chose! So very beautiful! I love the angle you used too. Happy WW! What a neat picture! Love it! gorgeous! I saw a few of these in town on my way to & from physical therapy. I would love one. we got a cold snap & now they are all done. oh how i miss the magnolias! 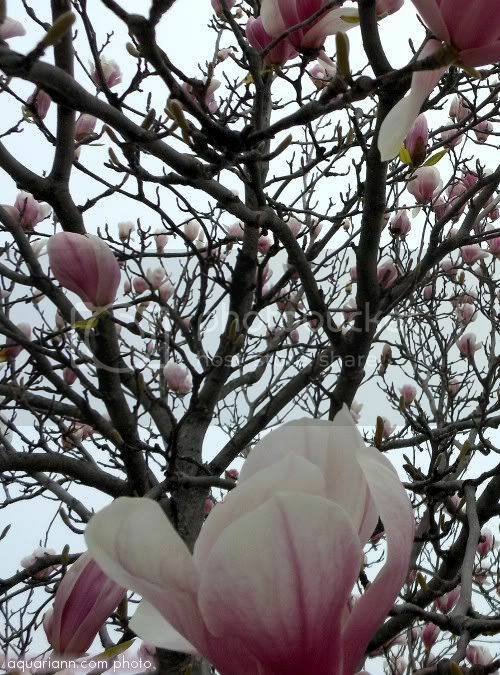 I love pink magnolias - I use to have a tree in the front yard of one of the first homes I ever lived in. It was the only thing I wanted for my 8th birthday. Hey it's Jet here. Mom said to tell you that we do not have magnolias in the tropics, however, she remembers these beautiful trees from her childhood. Gorgeous picture. It's sooo enchanting!! !...Just like you, miss Aquariann=)Happy Spring!! Wonderful blossoms. It must smell wonderful. WOW!! Beautiful capture!! Love it! I just love magnolias. Our neighbor used to have a large one on the property line, but he had to take it down. Really miss those gorgeous blooms! gorgeous! I love magnolia trees in bloom!